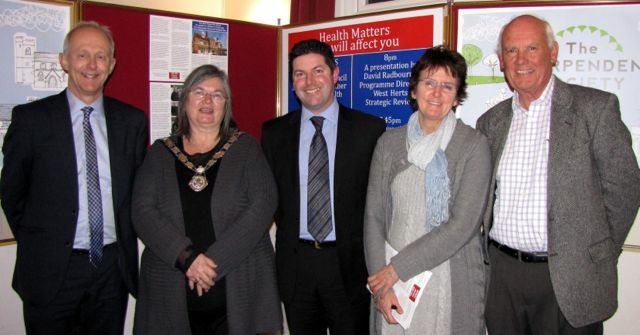 The Harpenden Society's declared policy of basing its public meetings on issues close to Harpenden He(a)rts scored another brownie point on 29 January when another all-ticket full house listened attentively to a first-rate NHS presentation. David Radbourne of the Herts Valley Clinical Commissioning Group (CCG) and Dr Jill Bartlett, GP Locality chair St Albans and Harpenden presented the structure of the ongoing review of services. David Radbourne is Programme Director of the West Herts Strategic Review which aims to find how well current health and social needs are met, what opportunities exist to meet future needs, how services should be accordingly configured and what would be the best methods of delivering them. As well as joining intently in the discussion, those present were asked to complete a questionnaire relating to this welcome Your Care, Your Future programme, while there was a warm response for David Law, Chief Executive of the of Herts Community NHS Trust. He reiterated the Trust's belief in the plan to redevelop the Harpenden Memorial Hospital site as a Health and Wellness Campus and hoped that it would be up and running in 2018, in spite of the several hurdles that had to be surmounted. David Law has been a sympathetic and courteous attender at meetings of the Red House Forum, the ginger group established by The Harpenden Society to this end. Both Davids Radbourne and Law were encouraged by the discussion, particularly in terms of the emphasis placed by several speakers on the value of preventative 'wellness' services and advice and the priority that should be given to local community involvement and support.